Ruskin Bond's books always make me feel nostalgic, books we have read when we were young and now fortunate enough to read them out to our children. Tigers for Dinner is primarily meant for children, but adults will love it as much. It is about the author's childhood memories when he recounts the tall tales of his khansama Mehmoud. Mehmoud earlier served as a cook to the famous hunter Jim Corbett, whom he addresses as 'Carpet-Sahib'. Mehmoud had been with his 'Carpet-Sahib' in his various hunting expeditions and has also camped out with him in the nights in the fearsome jungle full of ferocious animals. 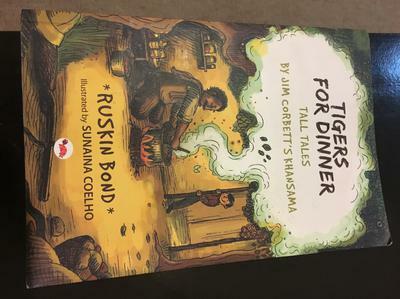 Later when he joined the household of Ruskin Bond as his khansama, he found a perfect audience in a young innocent boy to narrate his tall tales in which he encounters fearsome beasts and man-eaters of the jungle and boasts about being a hero. Carpet-Sahib would always praise him for his courage and reward him with unique gifts. They were all extraordinary feats of bravery; be it about smashing a tiger with a hot pan and pulling its whiskers away, wrestling a king-cobra barehanded, shooting a leopard with carpet-sahib's gun, escaping from a man-eating tiger which comes to the house seeking revenge, or saving a Maharaja from a wild boar. The boy listens to Khansama's stories wide-eyed and was in awe of his cook's courage. He, in turn, narrates all his stories to his classmates who over a period of time become jealous of him for having a super-hero cook. Only later does he realize that those were tall tales made up and told to him, but still such wonderful stories, that he decides to write a book on it. Ruskin Bond always keeps it simple, yet beautiful. The same applies to this book as well. The stories are narrated in such simple language but are so vividly described that you wish you were sitting with him and the khansama in the kitchen as their companion and eat the delicacies and drink the seasonal mango milkshakes. 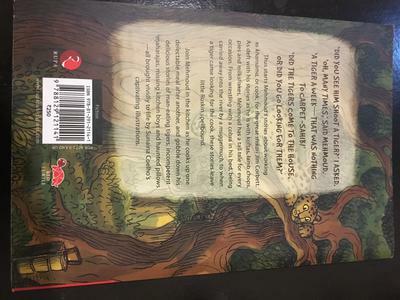 My six year old loved this book. He was listening to the stories wide-eyed and was in awe of Mehmoud who is now his new super-hero along with Jim Corbett. And I have enjoyed reading it along with him, diving into the world of hunters and the hunted, narrated in a lighter vein. Do not miss this book, especially boys under 10 will cherish it for years to come. Let them read and remember Ruskin Bond, as we do, to this day.